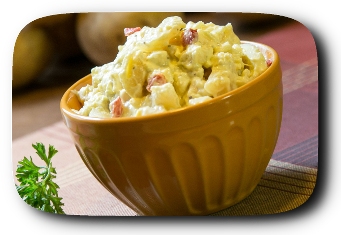 Herold’s Original Potato Salad – Our original recipe, Potatoes, onions, peppers, in a creamy salad dressing. Herold’s Original Potato Salad with Eggs – Our Original Potato Salad with diced hard cooked eggs. Herold’s Southern Potato Salad – Potatoes, with a mustard based salad dressing, celery seed, and pickle relish, onions, celery, red & green peppers. Herold’s Southern Potato Salad with Eggs – Our Southern Style Potato Salad with diced hard cooked eggs. 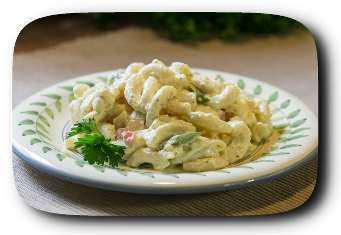 Herold’s Macaroni Salad – Elbow macaroni with peppers, onions,celery, in a creamy dressing with a touch of mustard. Southern Macaroni Salad – We've taken our Southern Style Potato Salad recipe and transformed it into macaroni salad. Our own mustard dressing blend with elbow macaroni, peppers, onions, carrots, celery, pickle relish, and southern seasonings. Herold’s Shell Macaroni Salad – Our macaroni salad recipe made with shell pasta. 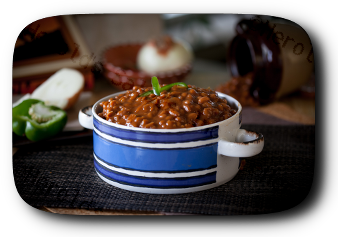 Herold’s Baked Beans – Our own baked beans, vegetarian style! Beans baked in a rich seasoned molasses, brown sugar sauce with peppers and onions. Serve warm or cold. This item is sold refrigerated. Herold’s Creamy Cole Slaw – Our extra creamy slaw, unlike any other! Shredded cabbage , carrots, extra creamy dressing. Egg Salad – Diced hard cooked eggs in a creamy dressing with celery. Sour Cream & Cheddar Mac – Shell macaroni in a mayonnaise and sour cream dressing with a touch of mustard, with real cheddar cheese, celery slices, shredded carrots, diced green peppers, onions. Chicken Salad Pilgrim's Pride by Pierce Chicken – All white meat chicken chunks in a creamy salad dressing with celery and seasonings. Amish Macaroni Salad – Elbow macaroni, hard cooked eggs, onions and carrots in sweet and tangy dressing, with mustard. Amish Potato Salad – Potatoes, hard cooked eggs, onions and carrots in sweet and tangy dressing, with mustard. © 2017 Herold's Salads, Inc.